"US horizontal oil rig counts were up 2 this week to 265, now 17 off the cycle trough five weeks ago. US vertical rigs were up sharply, +7 to 48. We can now call the cycle bottom here for May 27." Graph Courtesy of Steven Kopits of Princeton Energy Advisors LLC. 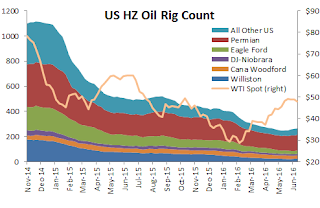 CR Note: This graph is horizontal rig count only (not vertical). The increase is still pretty minor.